ATLANTA, October 12, 2018 /3BL Media/ – The UPS Foundation today announced a $1.5 million commitment to support relief and recovery efforts for the earthquake/tsunami in Indonesia and Hurricane Michael in Florida. Through a combination of cash grants, in-kind transportation movements and technical expertise, The UPS Foundation, in collaboration with its disaster relief partners, will provide urgent relief, as well as support for long-term needs ranging from rebuilding to personal and financial recovery assistance. Last month, The UPS Foundation also committed more than $1 million to assist with Hurricane Florence relief efforts. When a disaster strikes, The UPS Foundation moves quickly to mobilize its relief network in support of first responders and immediate in-kind relief to assist with response and recovery efforts on multiple fronts. The UPS Foundation is working with the American Red Cross, Center for Disaster Philanthropy, Good360, International Federation of the Red Cross (IFRC), NVOAD, Operation Hope, SBP (Saint Bernard Project), The Salvation Army, ToolBank Disaster Services, United Nations High Commissioner for Refugees (UNHCR), United Way, United Nations World Food Programme and other humanitarian aid partners to provide immediate support and assess longer-term needs, committing additional funding and in-kind assistance for recovery needs that will be specified during the post-crisis recovery phase. The company has also activated skilled volunteers with humanitarian logistics expertise to support the American Red Cross and Global Logistics Cluster response efforts, helping to coordinate transportation of supplies to impacted communities in the U.S. and Indonesia. UPS and Hewlett Packard (HP) also continue to partner to bring internet connectivity to communities impacted by disasters. After transporting the HP Connection Spot trailer with Wi-Fi, internet access and phone charging stations to assist survivors of Hurricane Florence, UPS has again mobilized and prepositioned the trailer in Georgia, while HP assesses potential destination communities impacted by Hurricane Michael. UPS and The UPS Foundation have a history of leveraging the company’s logistics expertise and moving quickly to assist in delivering humanitarian aid and relief efforts globally after natural disasters. 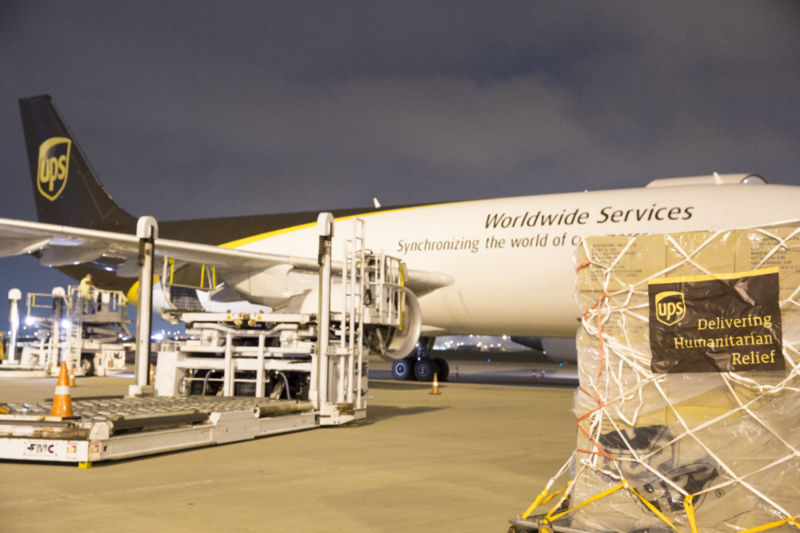 In fact, currently UPS is transporting relief supplies to areas hit by the 7.5 magnitude earthquake which was followed by a tsunami in Indonesia on September 28. Last year, The UPS Foundation responded to 26 major world disasters and invested more than $21 million in funding, in-kind, and technical support for community safety initiatives that included enhancing preparedness, urgent disaster response, recovery and public health strengthening. Building the resiliency that communities need to better withstand and recover from future disasters is an ongoing and strategically important aspect of UPS’s Humanitarian Relief & Resilience Program. Also last year, The UPS Foundation provided in-kind support of humanitarian aid and relief across 53 countries – almost $6 million worth of in-kind services – including loaned experts and relief shipments leveraging UPS’s owned and contracted global network in the air, on the ground, over railroads and on the ocean.